The 1980s were a time of tremendous growth for the hobby. New collectors were pouring in, many enticed by the lure of new players and potential riches. There are a ton of great baseball rookie cards from the 1980s. Some have held up well, while others have faded on the secondary market. But that's not necessarily a bad thing. For those returning to the hobby, these 1980s rookie cards now represent an alternative way to tap into some of the same feelings they experienced when they first got into collecting. For long-time baseball card collectors, there are several iconic rookie cards that were released in the 1980s. Today, some of those hold up better in our memories than they do in value. Jose Canseco comes to mind. 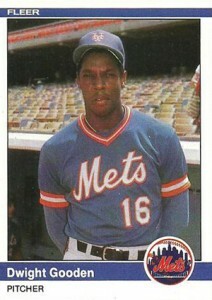 At one point, his 1986 Donruss rookie card was the king of the modern hobby. But then a ball bounced off his head, his career floundered and he became the mouthpiece of the steroid era. At their peak, 1986 Donruss Jose Canseco rookie cards were selling for more than $100. Today, graded Mint copies can be found for around $20. Canseco's fellow Bash Brother, Mark McGwire, has seen a similar fall from grace, again connected with steroids. The 1985 Topps Mark McGwire rookie card has always been a bit of a novelty because it pictures him in his USA jersey. In 1998 and 1999, the card soared to unbelievable heights as collectors looked for a piece of the single-season home run king. At the time, the economy was rocking and things like massive print runs were overlooked. Like Canseco, the 1985 Topps Mark McGwire lost steam, despite remaining instantly recognizable. The home run record was broken, his legacy was tainted and everyone realized just how many of the cards were out there. Despite some blips and drops, several baseball rookie cards from the 1980s have held up well and will continue to sell strong in the years to come. As more collectors return to the hobby, values may even climb a little. However the supply is so plentiful for almost all mainstream releases from the decade, the best route for those looking for a return on their investment is likely alternative versions of the cards, like Topps Tiffany, or professionally graded Gem Mint copies. Here is a list of the ten most valuable baseball rookie cards from the 1980s. While different collectors use different definitions for what a rookie card is, our list consists of the first base cards of a player from fully licensed sets that were distributed nationally. While highly desirable and great cards, parallel versions like Topps Tiffany and Fleer Glossy are not considered official rookie cards. To maintain consistency, this list is based on average realized prices for cards professionally graded PSA 9 Mint. 1983 Topps Baseball is one of the best sets of the decade. The dual-photo fronts remain a favorite with many collectors. Another thing that stands out is its deep checklist that is highlighted by rookie cards of Ryne Sandberg and Wade Boggs, and the second-year Cal Ripken Jr. 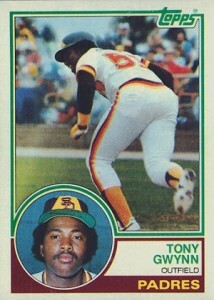 However, it's the 1983 Topps Tony Gwynn rookie card that stands above them all. Although the Hall of Famer has rookies in 1983 Fleer, 1983 Donruss and 1983 O-Pee-Chee, it's the 1983 Topps that remains the favorite among collectors. Perhaps the least recognizable card on this list, the 1984 Fleer Update Dwight Gooden makes the cut primarily because of the set and not the player. 1984 Fleer Update Baseball has long been considered one of the rarest sets of the era and still commands top-dollar today. Despite a tumultuous end to his playing career and several off-field incidents, Gooden still has a dedicated collecting base who look back fondly on his dominance during the mid-1980s. Chalk this one up to the power of Cal Ripken Jr. Few will argue that Fleer's first sets were lacking in the design department. Bland lines and out-of-focus pictures played a big part in this. 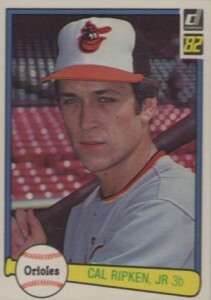 However a Cal Ripken Jr. rookie card is a wonderful thing. Although the least desirable of the great's first-year cards, the 1982 Fleer Cal Ripken Jr. still carries a lot of clout. Now that's a little better. With a more distinct design and a much more flattering portrait, the 1982 Donruss Cal Ripken Jr. is a slightly more popular choice among collectors than his 1983 Fleer card. 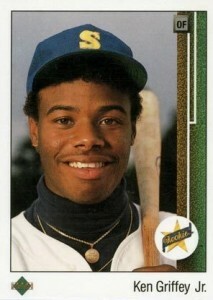 The 1989 Upper Deck Ken Griffey Jr. is arguably the most important and recognizable baseball card of the 1980s. It launched Upper Deck as a major player in the hobby and showed collectors what a mainstream premium card could look like. And while it's still an extremely popular card, supply now outpaces demand. This has brought the price of the iconic card down in recent years. More limited production, a classy design and one of the most beloved players of the decade collide on the 1984 Donruss Don Mattingly. Although his hopes of making the Cooperstown cut appear to be slim, Mattingly remains one of the most popular players in the hobby. Somewhat tough to come by, this rookie card has a great portrait of the first baseman. Wait a second. Bob Bonner cracks the top 5, but no Ryne Sandberg or Greg Maddux? What gives? Look to the middle of the card and you'll get the answer. 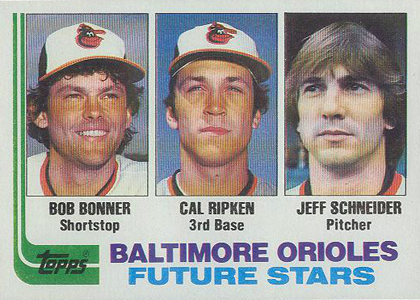 Out of all Cal Ripken's rookie cards, the 1982 Topps is the favorite among collectors. However, it's held back significantly by being part of a multi-player rookie card. 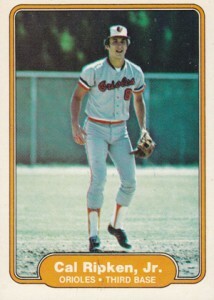 As a result, the 1982 Topps Traded Cal Ripken Jr, although not a rookie card, sells for much higher. 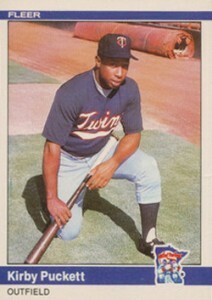 Like Gooden, the 1984 Fleer Update Kirby Puckett rookie card ranks high largely because of the set it's in. That's not a knock against the late Hall of Famer. Rather it's a testament to how strong 1984 Fleer Update Baseball is viewed. 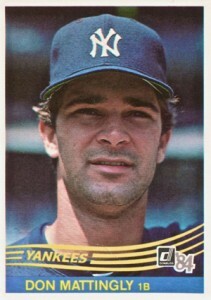 Although not the most attractive set ever, 1984 Fleer was a major step forward for the company. This particular card captures a very young and unassuming image of the enthusiastic hitter. 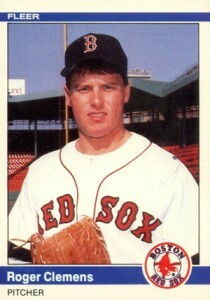 While rookie cards of other players connected with steroids have dropped out of sight, the 1984 Fleer Update Roger Clemens remains one of the most expensive rookie cards from the 1980s. It has a lot going for it, the main two being its limited availability and that it's Clemens' only 1984 card. Although a cloud will forever hang over the pitcher as to whether he used steroids, an induction into the Baseball Hall of Fame will mean a lot with collectors. Should Clemens get a Cooperstown call, expect this card to jump. 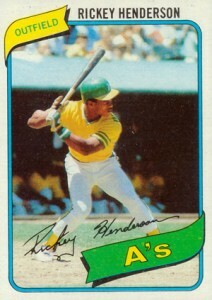 The 1980 Topps Rickey Henderson is such a beautiful card. Its nice design and classic pose have helped make it one of the most recognizable cards in the hobby, not just from the 1980s. Over his long and storied career, Henderson broke many records and helped transform the lead-off position. The 1980 Topps Rickey Henderson is tough to find in top condition, which also helps fuel its high price and position as the top baseball rookie card of the 1980s. I think griffey is number 1 in my book. That Rickey Henderson is one of my favorite all-time rookies. I remember I did empty my tiny savings account when I was a kid though to buy the Griffey. I have like a thousand cards (baseball,hockey,basketball and football) i found in the attic. I have been trying to sell them but can’t find any place in jersey. i have a couple Mark Mcgwires, Kirby Pucket, Pete Rose, Nolan Ryan, Ken Griffeys Jr , Bo Jackson and a few others. Help anyone?email me at glovekief@yahoo.com. WOW Griffey should be #1 by far!!! I’ll give you a $1 to toss them in a dumpster. Bebe � There’s a link a couple of comments above this one that has lots of ideas. I have every Mickey Mantle card made in the early 50’s. I have like willy mayes lou etc. I plan to get them graded the I’m taking them to a auction house and hoping I get what I’m asking. Patricia Rhoads is my name. I have a face book. My card collection is very large. The market is so soft for cards, they got overproduced. Too many companies too many of each card. Rookie cards not even worth much. I think Griffey was the top talent of the bunch in this list, however, there are so many of his cards in circulation it is ridiculous. The rarity factor of the cards from the early 80’s are much more difficult to find in good condition and IMHO represent the sport in its purity prior to the era of PED’s and moral controversy. i have 5.ooo 1980 rookie cards who would buy them? I have over 500,000 cards from the 70s /2008 more info to someone interested in buying the lot. Carmichael Ca. I,m not the origional owner he passed away several yrs ago and I don,t know how to sell them. I have baseball, football, some hockey cards from the late 70s,80s, and 90s that are in mint condtion what cards if anybody is looking for cards. I have 20 boxes of cards from baseball football hockey and even looney tunes gremlins even batman comic cards that are mostly in mint condition i know that there is a Billy ripken f**k face card in here along with jerry rice, joe montanas notre dame card, dan marino assorted “traded” and error cards what can u offer? Card collecting back in the 80’s and 90’s was iconic. You got 10-15 cards per pack with a stale piece of bubblegum. So so many memories, losing both my parents the past 3 years its wonderful to sit back and think about those days. They enjoyed watching me collect and look at my cards with me. I remember in 1991 or 1992 a buddy and I rode our bikes to a local gas station to purchase a few packs of cards. gas stations do not carry them anymore. But anyways, it was a pack of baseball cards, I do not recall the brand. Donruss, Fleer, Fleer Ultra maybe Stadium Club…just cant remember. But he got a Shaquille Oneill basketball card in the pack. We were dumbfounded, but he was in a LSU uniform just drafted by the Magic. So I know it had value. A local vendor at the flea market offered him $45 for it, he comtimplated. But i talked him out of it, a few hours later. The same vendor offered him $95. He said $100. Deal! He sold the card. About 6 months later we read in a Beckett magazine I believe…this card was more RARE than expected. 1 of 3 made !!! Book value….$699 !! Sells now for $2500. Make me sick thinking about it, we verbally agreed to trade my Jose Canseco rookie card for it. But I recanted when we went to make the deal. I love hearing others stories. baseball and football cards from 1970, 1980s and some 1990s, Rookie cards also…also some basketball cards from same era…our cards are in binders and covered with plastic card protectors…will not accept unfair pricing when selling.If interested in seeing and offering please contact me at above emai. I have a 1974 Topps#433 Lenny LaGrow card that Must be an error.the front has the pic of Lenny along with a partial picture on the left,on the backside is the centered stats.cant find anything about this card.can anyone tell me,did the card come out like this before they caught it. What’s the value of a 1974 Topps #433 Lenny LaGrow error card.